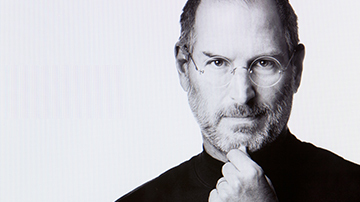 Steven Paul Jobs (February 24, 1955 – October 5, 2011) was an American entrepreneur, marketer, and inventor, who was the co-founder, chairman, and CEO of Apple Inc. Through Apple, he is widely recognized as a charismatic and design-driven pioneer of the personal computer revolution and for his influential career in the computer and consumer electronics fields, transforming “one industry after another, from computers and smartphones to music and movies.” Jobs cofounded and served as chief executive of Pixar Animation Studios; he became a member of the board of directors of The Walt Disney Company in 2006, when Disney acquired Pixar. Jobs was among the first to see the commercial potential of Xerox PARC‘smouse-driven graphical user interface, which led to the creation of the Apple Lisa and, a year later, the Macintosh. He played a role in introducing the LaserWriter, one of the first widely available laser printers, to the market. Steve Jobs is a Visionary. Steve Jobs is an Intellectual. Steve Jobs is a Creative.